If you are about to buy vintage guitar right now. I think this Official Vintage Guitar Magazine Price Guide is what you need to read before buy one. This book released only once a year but full of content. 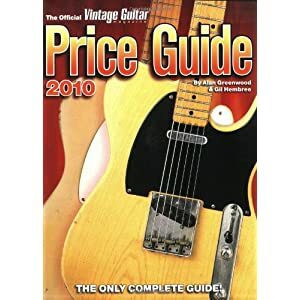 For more than 20 years, The Official Vintage Guitar Magazine Price Guide has been the industry-leading reference for values on vintage and collectible guitars, basses, lap steels, mandolins, ukuleles, amps, and effects. The expanded 2010 edition spans nearly 600 pages and includes information on more than 1,800 brands with more than 1,300 photos, plus a detailed look at the "hows" and "whys" of the collectible instrument market. This guide is the only such work to cover all this in one very affordable volume! To date more than 130,000 copies of The Guide have been sold.